Invite your friends and family in style with these beautiful christening invitations. Available as a pack size of 20 invitations or else select the “1 invitation” option and add exactly what you need to your cart. Our Christening Invitations by hiPP Australia are a beautiful contemporary invitation featuring stylish matt silver metallic foil. They are a simply stunning way to celebrate the sanctity of this milestone with a dignified but modern sensibility. 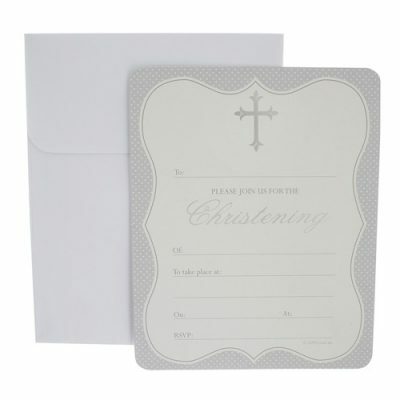 They are beautiful christening invitations. These invites are made from thick card and are beautifully finished as we would expect from hiPP products. Each pack contains coordinating envelopes and a self-adhesive magnetic strip for attaching to the back of the invitation.